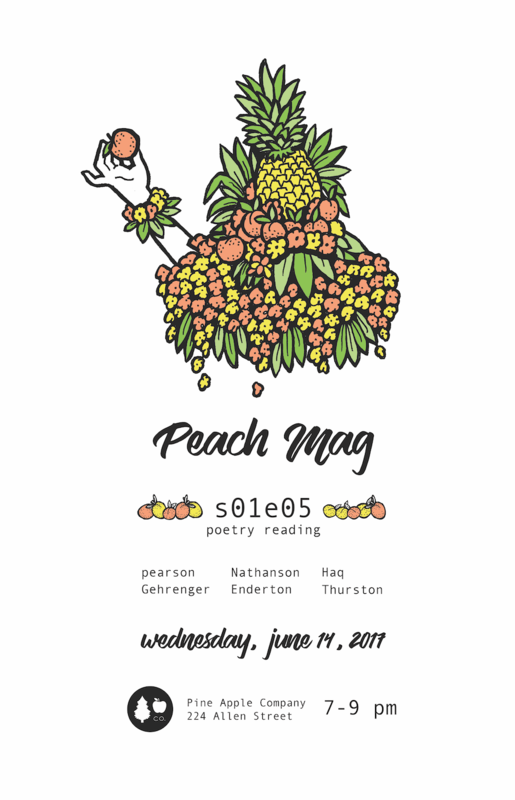 Peach Mag is excited to present visiting writers Elijah Pearson and Jo Gehringer alongside local writer Kevin Thurston and Just Buffalo Literary Center young writers Sage Enderton, Hannah Nathanson, and Sumayyah Haq for a reading on Wednesday, June 14th, from 7 to 9pm at Pine Apple Company. el pearson co runs Spy Kids Review & 2fast2house. they have 2 whole books 1 of which is called a nt & the other is called what if there aren’t enough twitter notifications to solve this. wow. follow them online @smallpuddle. Jo Gehringer is a mixed-race trans poet from Omaha, Nebraska. They currently live in New Orleans. Their work has appeared in Paper Darts, Spy Kids Review, Barrelhouse, and elsewhere. They tweet @unlovablehottie and they love you, like, a lot. Sage Enderton is a queer teenage poet living in Buffalo, NY. She enjoys fighting the patriarchy, unnecessarily large lattes, and old bookstores. She has had her work published in Right Here, Right Now: The Buffalo Anthology and Just Buffalo Writing Center’s Wordplay, and her artwork is to be displayed in the Albright Knox gallery this spring. Hannah Nathanson’s poetry has been published in Canvas Literary Journal, Wordplay, Speak Your Mind & Shape Your World, as well as several self-produced zines. She lives in Buffalo, where she attends City Honors High School and acts as a Youth Ambassador for the Just Buffalo Writing Center. Sumayyah Haq is a poet and student who will be attending UB in the fall. Kevin Thurston has been working for literature for quite sometime now. He’s been published and performed in the US and Canada. He is on the verge of publishing Color Me White, an adult coloring book, with illustrator Mickey Harmon.